Andaz Mayakoba’s 380 local experts are here to ensure your stay is perfectly curated. Enjoy the super soft white sand of Mayakoba Beach, cruise through the lagoon or meander the mangroves while surrounded by the sights and sounds of Mexican nature. Experience modern Mexico through vibrant décor that celebrates the colorful artists and heritage of the Mayan culture. Transcend traditional tacos and tequila at the signature restaurant Casa Amate which features exceptional Latin American dining and their popular Sunday brunch. Meet other guests at one of the many activities, lounge by the pool, stroll the shore or safely explore the enclosed Mayakoba community in one of the complimentary beach cruisers. 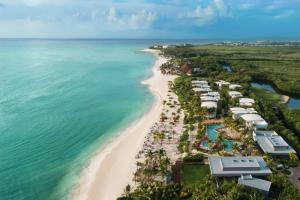 Located just north of Playa del Carmen in the Mayakoba Resort complex and just 40 minutes from Cancun International Airport.